Volvos are perennial favorites for their sturdy construction and the highest safety ratings on the road. Combined with class leading fuel economy and superior power, these Swedish luxury cars are always a smart buy, but it can take a smart repair shop to service them. Luckily, Menke’s has you covered with the technology and expertise to keep your Volvo running safe and at peak performance. From computer assisted engine analysis to factory approved scanners, Menke’s is fully equipped to give foreign cars the same great service that you would expect from a dealer. Stay Swedish right here in Newburgh—we use the factory approved parts and techniques preferred by Volvo to fix everything from computer programming errors to simple brake pad misalignments. With over two hundred and fifty years of combined experience servicing Volvos and other Swedish cars, we’ve got Volvo service down to a science. All this guarantees that the safest cars on the streets of Vanderburgh County stay safe, even after years of driving. What good is an excellent car without excellent service? Every technician at Menke’s is ASE certified to work on Volvos, and Menke’s itself is a proud recipient of the ASE Blue Seal of Excellence. We beat out 165,000 other repair shops to be named Motor Age’s Top Shop of 2009, and we’ve only gotten better since then. Quarterly training updates and the latest equipment in the industry means that we’re prepared to bring foreign vehicles new and old back up to factory fresh condition. Menke’s means superior training, superior technology, and superior service. That’s why we’re the only AAA Approved Automotive Repair Facility in the area. 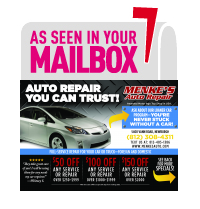 Menke’s offers more than just an exceptional repairs, we offer exceptional customer service, too. Because we know you hate being without a car, we’re proud to offer a free loaner car when you bring your Volvo in for service. Because we know you hate waiting, we offer a luxurious waiting room, free wifi, and fast and attentive customer service. Add on competitive pricing and friendly first name customer relationships, and you get a repair experience that goes well beyond expectations. Don’t just take our word for it, we were awarded the Angie’s List Super Service Award! No wonder we’re top rated garage in Southern Indiana. Trust the foreign car specialists at Menke’s, and find out why we’re leading the way in automotive repair!